Popeye cartoons gave me my first lasting memory of spinach...I was fascinated with the effect the vegetable had on him when he opened a can and gulped down the contents. I could hardly wait to see Popeye's muscles bulge as he changed into a whirling, punching machine. He magically went from a mild-mannered sailor to a master combatant. Our family seldom had canned spinach and when we did, I thought it was...not good for much. Its lackluster color, texture and flavor was unappealing, to say the least.Worst of all, nothing noticeable happened to my muscles when I ate it. Frozen spinach was the next step up from canned and at least maintained the bright green color inherent to the actual fresh vegetable. If cooked correctly, it even tasted like it should. As an adult, I learned that the best spinach is fresh spinach. It is wonderful in salads, steamed and buttered as a side dish or immeresed in a light broth or soup. Spinach has evolved from the dark and crinkly Savoy to the flat-leaf type. While the Savoy is more interesting, the flat is much easier to rid of sandy particles. Spinach is a vitamin-and-mineral-rich vegetable, and while some of its nutrients are not easily absorbed by the body...spinach has maintained its strength-inducing possibilities in my mind. Today's recipe is very light and has an oriental flavor especially if toasted sesame oil is used in the dressing mixture. This is such a pretty salad and shows that red and green do not always mean that it's Christmastime. Damp-dry the washed spinach with paper towels. 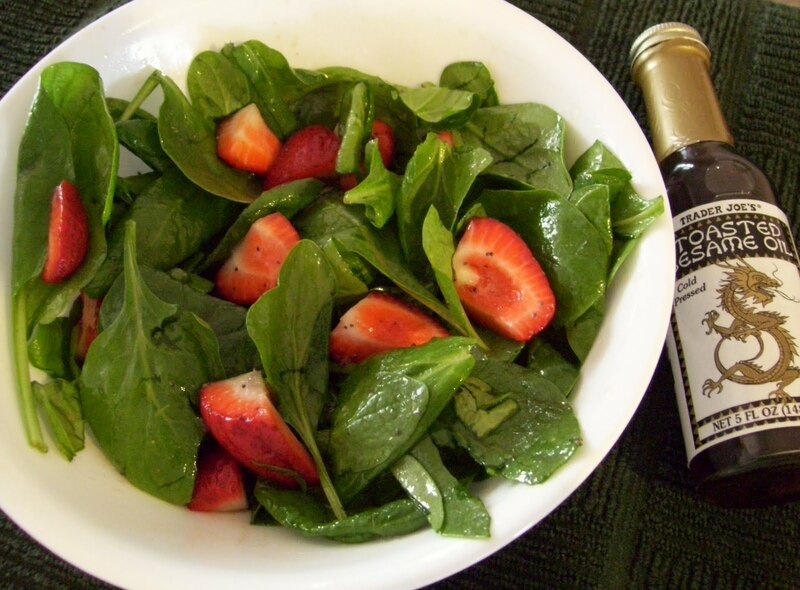 Layer the spinach leaves and as many strawberries as you like, in a large bowl. Mix dressing ingredients in a jar and shake well. *(I love the flavor of the toasted sesame oil, but it is optional to use instead of the sesame seeds). Drizzle dressing on salad and mix until leaves and fruit are coated but not saturated. Serve immediately.